Canada's third largest province, British Columbia, is truly spectacular and a vacation paradise. Residents of B.C. are aware of the beauty and take advantage of the many adventures it has to offer. 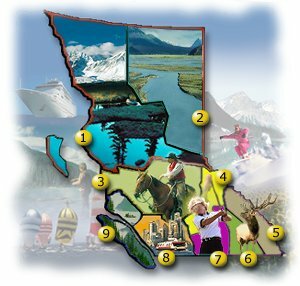 Within the province you will find the only desert in Canada, the highest mountains in North America (Coast Mountains), the highest waterfalls in Canada (Della Falls), the second largest granite monolith in the world (Stawamus Chief), one of the best birding areas in Canada and twenty-five percent of the world grizzly bears. B.C. has five national parks and close to 400 provincial parks offering residents and visitors alike the opportunity to enjoy the great outdoors. The land is very diverse with more than fifty mountain ranges, dozens of plateaus and plains with green valleys separating all the different areas. The climate varies from region to region as does the wildlife and vegetation. This all adds up to make British Columbia an outdoor enthusiasts playground, with opportunities that include whale watching to mountain climbing and everything in between. Hiking, whether short day treks or lengthy back country tours, is one of the most enjoyable ways to see B.C. and all it has to offer.